A plaque commemorates the centenary of Thomas Hardy & Sons winemaking. 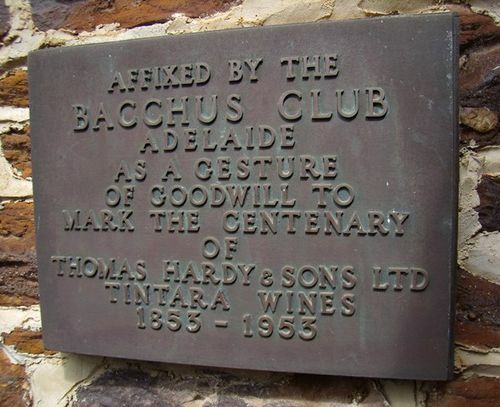 With three generations of the Hardy family present, the Bacchus Club yesterday unveiled a plaque at the McLaren Vale winery of Thomas Hardy & Sons Ltd., to mark the firm's centenary. Once a flour mill, which was purchased in 1878 by Thomas Hardy, the winery and the vineyards are one of the districts greatest sources of revenue and employment. In 1935 the residents of the McLaren Vale district erected an obelisk as a memorial to Thomas Hardy. The firm will continue its centenary celebrations this week. The Advertiser (Adelaide), 14 April 1953.